Restoring Your Roof With One Of Our Roof Restoration Options, Can Save You Time And Money. Are you dealing with wear and tear on your commercial roof system? According to the extent of the wear and tear, you will be faced with a choice between roof restoration and roof replacement. A roof restoration can extend the longevity of your roofing if applied before the damages are too severe. However, a roof restoration is only a viable choice if applied within the proper time frame, meaning that if you put it off for too long, you may have no choice but to replace. ECO Commercial Roofing is a reliable roof restoration company in Texas, Louisiana, and Mississippi that is dedicated to helping customers save money and get more out of their roof systems. Beyond saving money, a roof restoration can help you further as well! If you are looking to extend the life of your current roof, roof restorations are an excellent option. Instead of having to repair every damage on your roof individually, you can repair the majority of them in one fell swoop. We generally use roof coatings to perform these restorations, and the type of roof coating needed varies according to your roof type and needs. For example, polyurea coatings are ideal if you are in need of a faster application, and acrylic coatings perform particularly well in areas that experience extreme temperature changes. Your building’s commercial roof system is vulnerable to many different types of damage through its lifespan, from sun damages to weather damages. Contrary to other roofers that jump at the chance to perform an expensive roof replacement, it is our goal to ensure you have had an opportunity to explore alternate options first. By picking a roof restoration in lieu of a complete roof replacement, you can avoid spending thousands on labor and materials, as well as the headache of installation times. Cracked seams, torn roof membrane, and ponding water are all roof issues that can be addressed with a roof restoration. We’ve included some of our roof services below for your convenience, and please give us a ring at (833) 200-0571 to discover more about our professional roof restoration in Texas, Louisiana, and Mississippi! With fully insured roofers that are educated in industry standards, we work diligently to ensure total customer satisfaction each and every time! 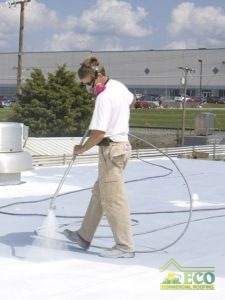 Commercial Roof Restoration Restoring your commercial roof, instead of replacing it, can save you time and money. Elastomeric Roofing Elastomeric roof coatings come in different varieties, but all will provide reliable protection against leaks. Flat Roof Restoration Restoring a flat roof can add over a decade to its lifespan, as well as repair many small damages at the same time. Metal Roof Restoration Restoring a metal roof will improve its energy efficiency, as well as increase its lifespan considerably. Polyurea Roofing Ployurea roof coatings cure faster than other types of roofs, allowing them to be applied in any climate. Rubber Roof Restoration Rubber roofs are very durable, and often require specific restoration techniques for ideal results. Silicone Roofing Silicone roof coatings are very water resistant and are a great addition to nearly any roof type.